As you know, HASA, Tom Marking, and others have been working hard over the years to get a fairer Catch Share Plan allocation of Pacific halibut to California anglers. We used to get 1% of the CA-OR-WA allocation (6,200 lbs), we now get 4% (29,640 lbs in 2016), and we’d like to get a longer term share that is commensurate with the halibut production contributions from California (at least 6% for next year). The June 23-28 PFMC meeting will be initiating scoping on the Pacific halibut Catch Share Plan Allocation, so now is a very important window for us to let PFMC and the State of California know how important a fairer Catch Share Plan allocation is to California anglers. This will also better enable CDFW to argue on our behalf for a fairer halibut allocation. Below is a potential letter template, and Tom and Mary Marking have suggested points on the HTC board (http://humboldttuna.com/smf/index.php?topic=12568.0 ), but feel free to modify as you see fit. As Mary points out in her HTC post, it would be great to get at least 100 letters, so please help us out and submit your comments. There are two submission deadlines; the first one is on Thursday, May 26 for inclusion in their initial briefing package, and the second one is on June 14 for inclusion in their final briefing package. The first deadline is a little better because it gives them more time to read the comments, but it is probably fine to submit by the last deadline (June 14) via e-mail (e-mail all comments to pfmc.comments@noaa.gov). Also, if you happen to be able to attend the PFMC meeting (Friday, June 24, in Tacoma Washington), please show up in person to deliver your comments to Council, and let us know that you can go so we can coordinate with you (Tom and Mary will be there, as will Scott McBain). Thank you for your willingness to help out on this important issue! Given a) the new information indicating substantial northern California shelf contribution to exploitable Pacific halibut (likely increased exploitable yield for Area 2A by 20%) , b) the importance of Pacific halibut to California recreational anglers, c) the importance economic contribution of Pacific halibut anglers to northern California coastal communities, and d) the recent rigorous implementation of California in season harvest management to not exceed the Catch Share Plan allocation, the Catch Share Plan allocation should be refined to provide a fairer and more equitable share of the Pacific halibut fishery to California recreational anglers. 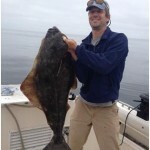 Humboldt Area Saltwater Anglers Inc.